In Part 1 we closely examined and reconstructed a Canadian Army exercise of July 1942 that took place on the Downs near Lewes. One incident that day was the deaths of three soldiers of the Princess Patricia's Canadian Light Infantry (PPCLI) who were killed when an artillery shell fell short of its target. 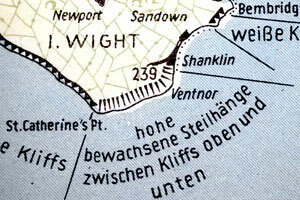 I've reproduced the map at right as a reminder of the situation at the time of the incident. 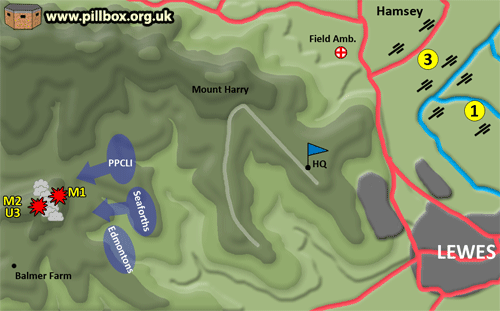 The PPCLI and Seaforths had taken Ashcombe Ridge and were digging in. In the meantime, 2 Cdn Field Regiment was engaging target M1 and 3 Cdn Field Regiment M2 on Balmer Huff before the infantry continued the attack. The plan for these targets was for each engagement to last one minute alternating as follows: M1, M2, M2, M1, then M1 and M2 simultaneously. 1 Cdn Field Regiment would then begin laying the smoke screen a few minutes later. Brigadier Tremain, Major Hazard and Captain Chambers moved up on the axis of advance with the Brigade Commander to the first objective, and were there while 2 and 3 Field Regiments were engaging M1 and M2. They had almost reached the top of the rise of Ashcombe Ridge when, at approximately 1006 hrs, one round from the 3rd Regiment fell short and landed on the most forward edge of our infantry on the Right, who had been ordered not to advance beyond the road running NNE across the top of Ashcombe Ridge. Brigadier Tremain immediately ordered Captain Chambers to go to the Set and stop any further firing by the 3rd Regiment until the guns were checked, and the C.O. of the 3rd Regiment returned to his Regimental area immediately. All guns were found to be correctly laid. The highlighted part of the last line illustrates the fortunes of war. The quote above does not specifically state that the Bren Gun team had advanced too far; in the excitement it was probably all too easy to lose track of their position, or perhaps they were simply seeking out the best possible fire position in terms of observation and defence. Even if they had gone too far, nobody could have predicted that a shell would fall short by 1,000 yards. It was seemingly immediately apparent that 3 Cdn Field Regiment had fired the short round; this was probably as the rounds fired either side of it had hit M2. The time of 10:06 (Z+36) for the accident may not be completely accurate as both 2 and 3 Cdn Field Regiments should have been engaging M1 and M2 respectively at this time. The only possible indicator might have been that the PPCLI were the most northerly troops, and 3 Cdn Field Regiment the most northerly guns and the short was along a trajectory that could only have been from 3 Cdn Field Regiment's guns. As we have already seen, the exercise involved a complex programme of live ammunition being fired onto various targets across the Downs. The graphic below is a cross-section of the area showing the relative heights and locations of the main artillery targets. Note how the guns are on the low ground at Hamsey; the gunners can't even see the target area they're engaging and this is by no means unusual. 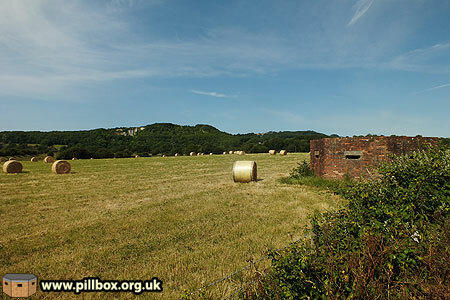 The photo at right shows a field at Hamsey in which some of 3 Cdn Field Regiment's guns were located during the exercise; the targets are 3-5 miles away over the downland ridge in the background. 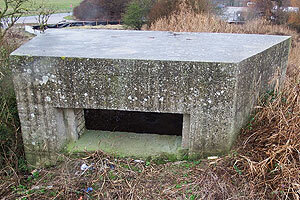 The Type 24 pillbox is a 1940 relic of static defence. The eyes and ears of the gunners were the Forward Observation Officers (FOOs) who would have established a network of observation posts (OPs) overseeing the battlefield in order to direct and correct fall of shot by radio or field telephone. Unfortunately, the documents omit to tell us where the OPs were during the exercise. As the guns were firing a pre-arranged fire plan, there would be no need for the FOOs to direct fire, as the targets for the exercise were already registered. A day of great rejoicing this is! Divisional Artillery advise that we will shortly receive twenty-four brand new guns - 25-pounders MkII no less, something we have been waiting for since we arrived in this country. The other two regiments also note new guns being received in the subsequent weeks and months. This is interesting as it means the guns used during the exercise were actually the 25-pounder Mk.I, more commonly known as the 18/25-pounder. This weapon (photo at right), was essentially a First World War 18-pounder gun that had been modified to fire 25-pounder ammunition. 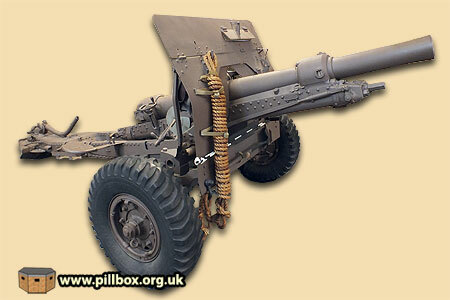 Whilst not necessarily a bad weapon, the Mk.II was far superior and this gun and its subsequent variants are most synonymous with the term "25-pounder." A Court of Inquiry ruled that the three men had been killed by a 25-pounder round fired by 3 Cdn Field Regiment falling short. How did this actually happen? Firstly, this was not first short round fired by 1 Canadian Division's three field regiments, either on the Lewes Field Firing Range, or even on the day of the accident. During a previous exercise at Lewes (very similar to the one in question) 3 Cdn Field Regiment had experienced a short round. Before the actual live-fire exercise took place, each of the regiments had to register their respective targets. This entailed firing a few rounds at each target and, once the fall of shot was correct, the "lay" of the gun was recorded. This enabled the same settings to be applied in order to hit the required target according to the exercise timetable. Registration was undertaken one regiment at a time and before the exercise took place in order to avoid troops being hit by accident. On 8 July, 3 Cdn Field Regiment were scheduled to register their targets 05:30 - 06:30, but a communications breakdown saw one battery overrun their time and they did not finish until after 2 Cdn Field Regiment had begun their allotted time. A more detailed report states that the charge fired was correct, as was the range and lay of the gun. 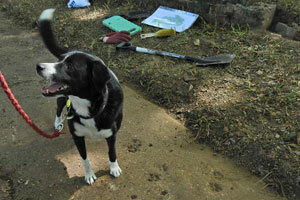 These details were confirmed by an inspection by an officer, a sergeant-major and a sergeant. Crucially, the same gun was instructed to fire another round on the same lay; this landed exactly on target. This latter point lead to the report questioning whether the round wasn't actually fired by 2 Cdn Field Regiment, who were registering at the same time. This issue was later commented on by the Commanding Officer of 3 Cdn Field Regiment, who appended the report and described it as a "badly laid round" by one of his batteries. This seemingly implies human error in the lay, despite the gun settings having been found to be correct. The exercise went ahead and no further incidents occurred. During their registration of U2 one round fell approximately 1000 yards short. This was checked immediately by two officers of the Regiment and the gun was found to be correctly laid in every respect. Another round was fired by the same gun at the same range; this round hit the target. The short round may have been caused by a faulty charge. This is important because 2 Cdn Field Regiment appear to have replicated their sister regiment's mishap of 12 days previously; a short round fired from a correctly-laid gun followed by a perfect shot on target. It appears the same circumstances occurred during the exercise, causing the tragedy. As part of the investigation of the tragedy, all gunnery data, records, firing programmes and lot numbers of ammunition were collected and analysed. The shell case that had produced 2 Cdn Field Regiment's short round during registration was examined and found to contain a residue partially composed of a "ropey-looking material." The shell case was sent off for investigation. The lot numbers supplied by both regiments did not match. Unfortunately, as all of 3 Cdn Field Regiment's guns were firing a concentration when the accident occurred, the individual gun could not be identified and so the lay of the weapon could not be confirmed. However, as the regiment did not cease fire immediately, it is possible that the gun in question fired again - and on target, as there were no other short rounds. A Major had been moving between the regiments during the exercise and checking the lay of guns; he didn't report any errors for the guns he inspected. Today was "Court" Day in the Regiment - 2 Courts of Inquiry and 1 Court Martial in full swing at one and the same time... (HQ) was overrun with strange officers and other ranks, being witnesses, members, drivers, etc. The 2 Courts of Inquiry were convened by G.O.C. 1 Canadian Division to investigate the circumstances surrounding the death of three soldiers of the PPCLI during the Battle Firing Practice on 20 July, one court concerned itself with endeavouring to find out if personnel were responsible, and the other, if technical faults were responsible. We obtained a rough copy of the proceedings of the Court assembled to investigate the personnel side of it. The Court's opinion was that they were killed by a 25-pr shell which fell short. We have heard nothing as to the opinion of the other Court. It seems as though the Court Martial was not related to the incident and that no responsibility was attached to Regimental personnel. The fact that the report of the 'Technical' Court was seemingly withheld is interesting, as no trace of any final outcome could be found amongst the war diaries or reports of any of the units involved. From these assertions it seems that the error was not human or the fault of the guns; two of those guns are verified as having been laid correctly and hit the target with their next round on the same lay. 3 Cdn Field Regiment was engaging target M2 when the accident happened; according to the time given for the short round, each gun of the Regiment would have fired at least two rounds on target by this time, indicating that all guns were correctly laid. The Regiment continued shooting after the accident due to the delay in receiving the cease fire order. As the Regiment then successfully engaged target U3 without any short rounds, we can assume that it was a carbon-copy of the previous two short rounds. When Captain Lorne Taylor of 1 Division Ammunition Company was in the office the other day we asked him what "NH Propellant" was. On 28 June we passed on to Batteries instructions regarding NH Propellant but we couldn't find out what it was. Captain Taylor didn't know but promised to find out and today he said that a British Ammunition unit told him that NH propellants are NCT/NH and are marked with letter "O" in a rectangle on the box and on the cartridge case. We passed this information to the Batteries. It therefore appears that American propellant was a very recent introduction to the field regiments - seemingly 10 days before the first short round occurred. Given that this issue is specifically raised for each short round, it is likely that this is where the problem lay. Maybe it was the use of older guns, perhaps with worn rifling, that acted in combination with faulty propellant. It may be no coincidence that all three field regiments began to be issued with brand new state-of-the-art Mk.II 25-pounder guns just weeks afterwards. Another interesting fact is that the regiments received their new guns in the order in which they ranked in terms of short rounds. 3 Cdn Field Regiment seem to have received most of their new guns in August 1942, 2 Cdn Field Regiment in September and 1 Cdn Field Regiment in November. Why is no mention made of the outcome of the Court of Inquiry? There may be two reasons for this. 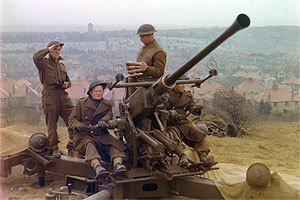 Firstly, artillery is a highly important aspect on a modern battlefield; if rumours go around that the guns/shells are faulty and drop rounds short, then confidence among the infantry that rely on artillery support is going to be reduced. Secondly, if the propellant, made by the US, is thought to be causing deaths, then relations between the Allies might be affected, particularly if the enemy propaganda machine gets to hear about it. Something that has been absent until now are the names of those who were killed. When I first stumbled across the incident in the documents, the first thing I did was to search the Commonwealth War Graves Commission database to identify them. Strangely, of all the units that participated in the exercise, including the PPCLI, none of the documents I have seen actually name the victims. 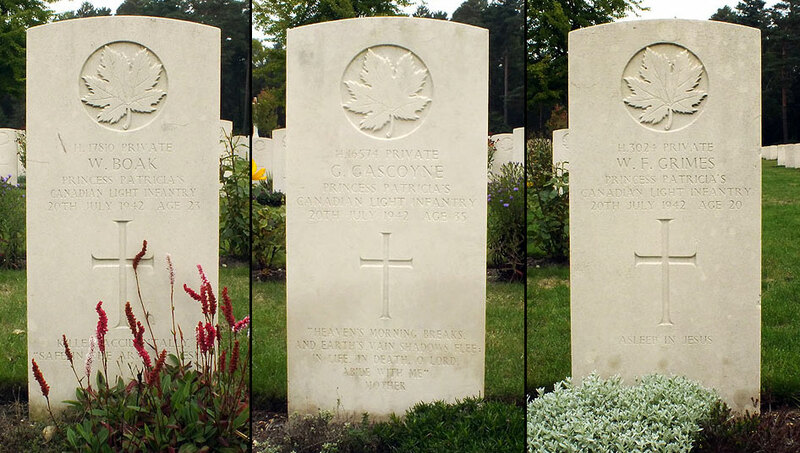 They were: Privates William Boak (23), George Gascoyne (35) and Warren Grimes (20) and they lie alongside each other in plot 32 of Brookwood Military Cemetery in Surrey. All concerned had to move on from the tragedy; using live ammunition under war conditions made such incidents a statistical certainty. These men were not the first victims of "friendly fire" and they were not the last. 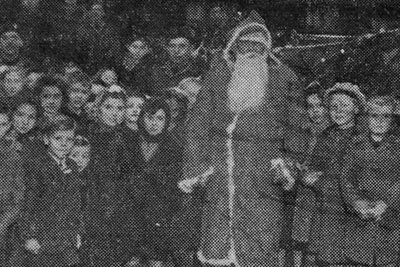 Sadly, another fatal incident occurred at Lewes just four weeks later. Part 3 will be posted in due course.